As noted in a previous post (here), this is installment 2 of my RRR! Let's see what juicy goodness flickr Interestingness brings us this time!As noted in a previous post (here), this is installment 2 of my RRR! Let's see what juicy goodness flickr Interestingness brings us this time! Sweet! 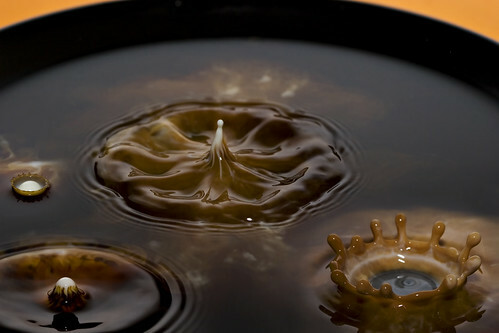 A water drops photo... very cool. Something easy to learn, yet very difficult to master! 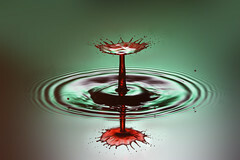 This fantastic photo was taken by the appropriately (though potentially confusing) named Drippy2009 who, upon looking at his flickr account focuses on doing such water drop photos. And I must say, he does them masterfully! If you're new to photography, or more specifically new to macro, these may look incredibly difficult, and can be if you don't know what you're doing. But you're in luck, Mr. Drippy has a blog dictated specifically to capturing these sorts of shots! So, if you're interested in ever trying this... you must go to his blog! I love the reflective properties of the water in the images above and below this text..
And below he took an interesting perspective by looking down on the drops... you don't see this often, if at all! 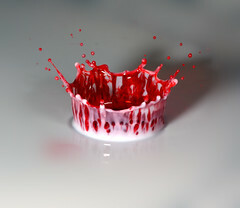 Go check out Drippy's portfolio if you want to see more of these awesome images! I spent a few hours one day trying to put my own twist on these types of shots. I wanted to put more than one drop in a shot and built a system that involved two small stirring straws crossing each other with each end dripped in the cream. I then would hold the 'cross' above the coffee gently shaking the straws until four drops would fall close to the same time...took me many many tries! Drippy's are still clearly better, but now I'd like to see him do something like mine by having several in one shot, I imagine he'd blow us away! Thanks for the inspiration Drippy.. I'll have to read your blog some more and try this again!